I have posted a lot recently about the benefits that older dogs receive from Vet-Stem cell therapy, so now I’d like to share an actual case with you. Maggie was adopted from a shelter at five months old. 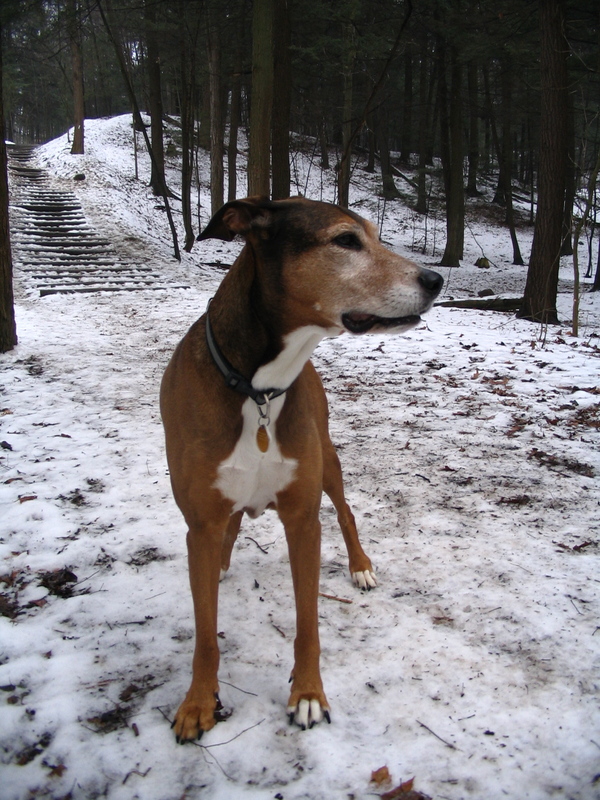 A Doberman mix, Maggie was an extremely active girl who reveled in long walks and car trips to new places with her mom and her dog-buddy Hopey. By age nine, her go-go-go lifestyle had lead to ligament injuries in both knees, for which she had an orthopedic surgery called a TPLO (Tibial Plateau Leveling Osteotomy). While the surgery was deemed successful, she still relied on medications to help her cope with pain as she aged. Although not unusual for a dog her age, Maggie’s difficulty getting up after laying down and navigating stairs at 13 motivated her owner to seek a way of revitalizing her faithful friend’s spirit as well as her body. “The thing I am the most pleased with about the stem cell procedure is seeing Maggie’s spirit come back. We often keep our dogs going longer than what might be right for them because we don’t want to say goodbye. It seems like the stem cell procedure has given Maggie more time to enjoy a proud, happy and physically able life and, as a result, it’s given us more time to enjoy her, knowing she feels great and we are not asking too much of her. At 14 she’s one of those rare healthy dogs. No one can believe her age especially now…post-stem cell procedure. If it weren’t for her white face and a tiny bit of early dementia (she stares at foliage from time to time!) she’s pass for 9. I highly recommend the procedure to anyone with a dog like Maggie: older but not at all on her last legs. I suspect her legs will take her to the end of her days and that’s a nice way to leave this earth…able and proud. I love this dog and I have been blessed to share these years with her. It’s nice to see a friend smile again.